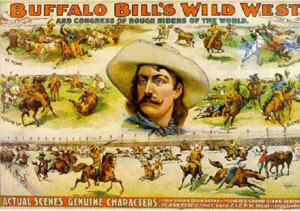 The story of Buffalo Bill Cody is well known. 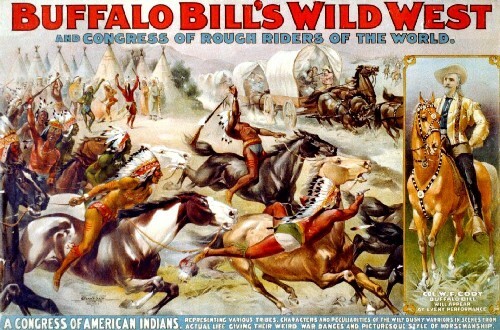 During his youth Buffalo Bill was, it is claimed, an Indian fighter, buffalo hunter, gold miner, scout and Pony Express rider. With the assistance of eastern newspapers, Buffalo Bill developed into a true western legend whose Buffalo Bill Wild West Show toured the country for many years around the turn of the century. 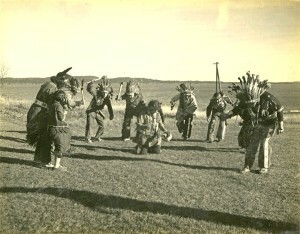 The performers in Bill’s shows were billed as “authentic” Wild West Indians- usually Sioux for their reputation as fierce fighters- and the toughest cowboys the west had on offer. You may be surprised to learn that the Indians were often not Sioux but Eastern Indians from such places as Pleasant Point and Buffalo Bill was born not in the wild west but rather, we submit, in Washington County. Historical records say Buffalo Bill was born in 1846 in Le Claire, Iowa. However according to an article in the Calais Advertiser dated August 19, 1903, Buffalo Bill was actually born in 1840 in an old frame house in Columbia, Maine on Foran hill. His father was James Cody and his mother was Bridget Foran who died during childbirth. James married twice more and finally moved to Cincinnati with his son and third wife. The author of this article, L. Cassidy of Calais, is very specific about many details of Buffalo Bill’ s early life, including the location of his mother’ s grave, the location of the homes where the family lived and their religious preferences. Cassidy claims he had many long conversations about Buffalo Bill with a nephew of Buffalo Bill’s mother, one Patrick Foran, who was still living in 1903. Intrigued by the detail in the article and being absolutely sure of its accuracy, else why would the Calais Advertiser have printed it, we decided we should bring this startling news to the attention of the folks out west who were erroneously claiming Buffalo Bill was born there and, by the way, making no end of coin falsely claiming him as a native son. We did some research on the web and eventually made contact with the curator of the Buffalo Bill Museum and Historical Center in Cody, Wyoming. After a very pleasant exchange of emails, we sent the director of the museum the article. She found it interested but pointed out that her organization had many official documents, including a birth certificate, indisputable historical records and lengthy interviews with Buffalo Bill, his mother and siblings to substantiate their claim that Bill was not a Yankee. We had only the article which we gather she judged to be a complete fiction. She was, however, kind enough to promise to give the article a place of honor in the museum’s Imposters file. We were a bit taken aback that our Buffalo Bill was relegated to the “imposter file” on such scant evidence but our research into the author of the article, one L. Cassidy, wasn’t reassuring. The only L. Cassidy in our records from Calais was Louise Cassidy who in 1895 was dispatched to the “Industrial School” in Augusta on the petition of her father for “falling into habits of vice and immorality”. Pending additional proof the Buffalo Bill Heritage museum in Columbia is on hold. We haven’t much information on Joseph. There was a Joseph Soctomah who married Susan Paul in Calais May 17, 1892 and reference to a Joseph Soctomah from St Andrews whose son James married Mary Mitchell DOB 7/24/1888 at Pleasant Point on February 16, 1904. Their daughter Christina, born in 1907, had a daughter Mary Verna Tomah who died in 2012 at Indian Township. Donald Soctomah probably knows the genealogy of the family. 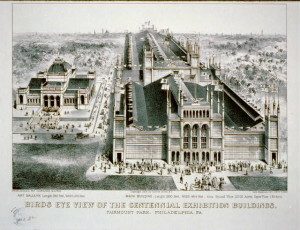 The photo above by the way does not include Joseph as it was taken in 1938. 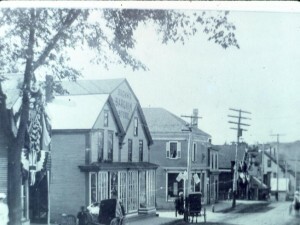 Wallace later became the Indian Agent and his wife, always referred to as Mrs. Wallace Brown, became a national recognized authority on Passamaquoddy customs and language.